Heading out on safari in a couple of weeks required a fresh look at projectiles. Vihtavuori N120 has long been my favorite 10ML-II powder with 300 grain bullets, with the 300 grain .458 Barnes Original Spitzer Soft Point (MMP Orange .458-50 sabot) being one of the most accurate long range loads I've found-- shooting inside 1-1/8 in @ 220 yards if I flinch right. That bullet has become popular enough that Barnes can't seem to keep them in stock. If anybody wants some this year, they might wish to consider getting them on order directly with Barnes. If there is such as thing as a "favorite" sabot, the MMP Orange .458-50 qualifies. It appears to be the most forgiving sabot made today. I attribute that, in part, due to the relatively thin petals. As in many gasketing applications, the thinner the gasket, the better. Using flat base bullets of .458 diameter yields a greater bearing surface at the base of the bullet, spreading sabot base stress over a larger area and inflicting far less stress than a .44 caliber or .40 caliber bullet with a smaller base. I don't care for boat tail bullets in sabots as a generality, for similar reasons. It is not that they cannot be made to shoot accurately; of course they can. They are less forgiving, though, and don't like high-performance loads nearly as well. Vihtavuori N120 has the lowest heat of explosion of any Savage compatible powder I've found-- that is also "forgiving" in all the right ways. The velocities have always been both excellent and consistent; though N110 remains a better choice for 250 grain arena bullets. So why not use the Barnes Original SSP for African plains game? Well, I believe it IS an outstanding choice. On a pronghorn hunt last year, I told my guide if I could make it to the side of an old windmill without being busted-- I'd whack what was judged to be 'shooter.' I did, leaned against part of the rusty windmill and let her go @ somewhere around 185 yards: an intentional honey-hole shot. It was a complete pass-through, and flipped the buck like a rag doll. The guide commented that he had "never seen knockdown like that before." Well, the pronghorn was down, and down for a long time. Nevertheless, he got back up and moved off at a lot less than 'speed-goat speed' in the opposite direction from whence he came. I sped up his demise, firing a second shot at 287 laser-verified yards. That was the last step that pronghorn ever took. The Barnes Original has been a supremely accurate bullet for me, but it is also an extremely tough bullet with a .032 in. thick jacket. For breaking bones and the "double shoulder shot," as well as giving you the ability to take a raking shot, it is excellent. At closer ranges and higher terminal velocities, it hardly matters as Art Seaman and Dwight Scifries, among many others, can attest. I shot a boar earlier this year over dogs (okay, between them) at perhaps 8 yards. Zero steps, with various crimson boar vitals strewn up the leaf covered hill. For expansion, you need about 1600 fps terminal velocity. 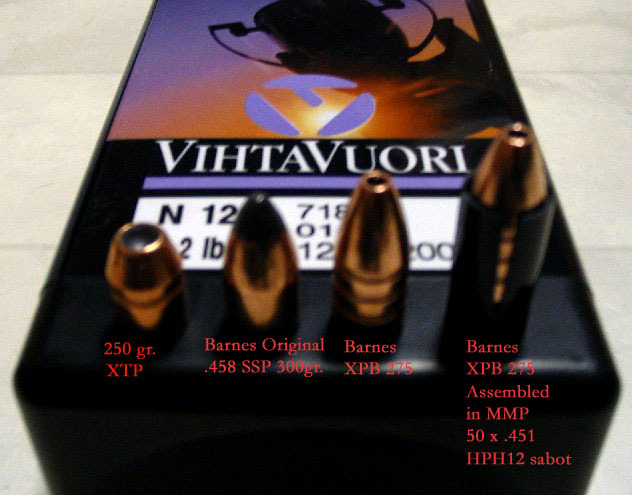 The Barnes XPB .451 275 grain has been shown to expand to 140% (or more) of its original diameter at 1400 fps. It has also been shown to out-penetrate 300 grain (or heavier) conventional bullets, with virtually complete weight retention. It has no velocity limitation out of a muzzleloader I'm aware of. 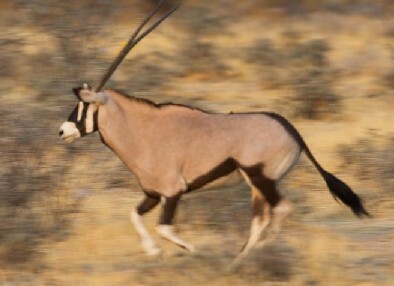 It seems that some 30 species of game are in the area we are hunting in Africa, from a large variety of relatively light, thin-skinned antelope to warthogs, greater kudu, waterbok, eland, and the gemsbok as depicted above. The Barnes 275 XPB married to a MMP HPH-12 sabot is as close to an all-purpose combination as can be hoped for. Recent range work has been with ambient temperatures approaching 90 degrees F.; humid as well. 59 grains of N120 pushing the 275 gr. XPB has clocked 2290 fps with ¾ MOA or better 100 yard 3 shot groups. This is far more accuracy than can be used in the field, and more than I could really hope for a "year-round, all purpose" loading. It may be the best muzzleloading combination that there is, at least in my rifles. That's the load, and that's what's going to Africa. Naturally, I'm looking forward to it-- and will report the field results.